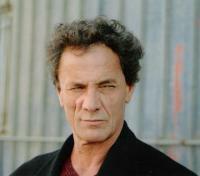 Lyad Samoudi the film’s Executive Producer, was killed at Alyamoun at the end of the filming by Israeli soldiers on 23 June 2002. 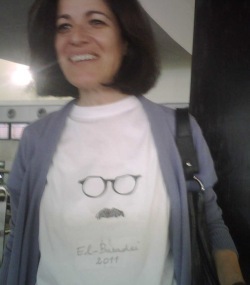 A member of the ElBaradei family sporting this great home-made T-shirt. After spending most of yesterday at Cairo Airport covering Mohamed ElBaradei’s return to Egypt, it’s worth taking a step back from the infectious enthusiasm of his supporters and listening more carefully to what they say — and what people close to ElBaradei believe he intends to do. A member of the ElBaradei family sporting this great home-made T-shirt.But before I do that, I think it’s fair to note that yesterday’s welcoming committee was a success. There were over 1,000 people at the airport, the story got covered everywhere, and it has legs. It energized his campaign, even if many were disappointed that ElBaradei did not speak at the airport. I think he probably should have, but the conditions there were not good: supporters and journalists were crushing each other, there was no platform, and too many people to be controlled easily. One important reason for the success of the welcome was its timing. I think it might be no coincidence that ElBaradei decided to return to Egypt on the day that Egypt faced its Universal Periodic Review at the UN Human Rights Council and the day that Barack Obama met with Egyptian democracy activists Gamal Eid and Bahai Eddin Hassan. There was a lot of international attention on the question of democracy and human rights in Egypt that day. The regime’s propaganda may have scared off some (newspapers had reported on-the-spot fines of LE1,000 — $182 — and massive security presence, both of which were untrue) but plenty turned out and a repressive approach was simply not possible. In the first of its lecture series, In Translation, AUCs newly established Center for Translation Studies, hosted leading Arabic-English translator Denys Johnson-Davies who shared his memories and encounters with Arab writers during his extensive literary career, including Naguib Mahfouz, Tawfik Al Hakim, Yusuf Idris, Yahya Hakki, Edwar Al Kharrat, Tayeb Saleh and Salwa Bakr.